The pervasive feeling among country’s leading educationists is that effectively higher education is not anybody’s concern and there is a fundamental lack of understanding on how higher education ecosystems naturally work and grow. And, this is not a recent development. In fact, the denial of a rightful place for higher education in country’s socio-economic progress is fraught with dangerous consequences for national development goals. The government mindset over the years has evolved around control, standardization and unnatural expansion of higher education with under investments. In fact, educationists point out to the fact that the Radhakrishnan University Education Commission of 1948 which predominantly comprised of educationists, had stated that state aid shouldn’t be confused with state control. Circa 2016, TSR Subramanian committee, majorly a bureaucratic panel ended up recommending All India Education Service cadre for bureaucratization in education. Drawing on past studies and his own experiences in some of the finest institutions of higher education in India and abroad, Pankaj Chandra ,Vice Chancellor of Ahmedabad University, in his book states that higher education in India is characterised by regulation and bureaucratic control; low investment in learning and physical infrastructure; poor quality of teachers and teaching; corruption, nepotism and student violence. Prof Chandra is a former Director of IIM Bangalore and was member of the Government of India’s Committee to Advise on Renovation and Rejuvenation of Higher Education (Yashpal Committee) which gave him an opportunity to visit universities across the country and understand their state of governance. The LEGO self-replicating toy concept applied to replicating country’s reputed public education brands such as AIIMS, IITS, IIMs, and now central universities in more places is a success yet to be proven. The established wisdom that coming up of universities or expansion of higher education is a consequence of development and not cause of development has been completely turned on its head while establishing new central universities—most struggling to create an identity. “How institutions grow is not fully understood, these grow organically and must have a link to the place these are situated in. The whole assumption that quality comes from standardization and model curriculum is absurd. And the situation has been made worse by regulator (UGC) to issue circulars on day today basis in a mindless attempt to control and standardize everything,” said Prof Shyam B Menon. The Government mindset is to work by rules and not service. According to Prof Niraja Gopal Jayal the downslide of higher education after formation of UGC must a subject of research and we must examine the frequency and intensity of regulations and their impact. Undermining of academic excellence and freedom is killing. Institutions are built faculty by faculty, department by department. How to inject quality in a system is already eroded. We as a community of scholars are unwilling to exercise judgment. People are compelled to buy credentials. Aren’t PhDs sold and bought? The API (continuous Academic Performance Indicators) is another exercise thrust upon academics that has become of suspicious nature. Secondly, as against about Rs 2.5 lakh crore from education cess on school education, the share of higher education has been a mere Rs 1100 crore. This is a telling statement of financial resources for higher education spent in a country faced with so many unique challenges where only higher education can provide solutions. According to Prof Furqan Qamar, a former Vice-Chancellor and now Secretary General AIU (Association of Indian Universities), in terms of per capita expenditure on student in India of the best ranked institution is compared globally, it is miniscule. “Excellence doesn’t come cheap. And if you add expansion and equity to it, then the costs are even higher. Globally, the fee by student ranges from 2-3% to 10% of the cost. As such public spending on higher education is inevitable,” he adds. Public universities are nudged to raise their own funds even though experiences have shown that direct government support to higher education works much better. Thirdly, the universities are places where coming up of new ideas and freedom of expression is natural. The culture is inherently that of conflict. But universities are great places to handle these. According to Pratap Bhanu Mehta, while STEM (science, technology, engineering, maths) streams are relatively protected, the humanities has a crisis on campuses. India being a deeply casteist society is also unfortunately getting divided on campuses. The anti-intellectualism and violence is also growing. “Expressions and simmering on politics and political issues will be heard on campuses where these could be controlled implosions and if you don’t provide space for this in campuses then these expressions will erupt somewhere outside as uncontrolled explosions,” said Prof Menon. A matured debate culture has to be nurtured and institutionalized. Universities are places that also bring different people together and this unity in diversity must be respected. Another important issue touched by the panel was on linguistic divide. According to Prof Apoorvanad, the openness towards languages was historically lost with the three-language formula and how languages like Sanskrit has been misused by evaluators, who give marks on every drop of ink. “The tragedy today is that most people don’t know how to write even in Hindi?” Prof Jayal provide an overview of how JNU has recruited English teachers for improving English, which is proving a success given that in globalized world, scholars have to travel to present their papers. She said that writing labs has becoming a global phenomenon and we must constructively bridge the divide. She also pointed out that translation of good books must take place, which at present doesn’t. Prof Chandra contends that the university is different from a bureaucratic or commercial organisation, but has not been managed differently. As a result, it no longer remains a safe haven for new experiments, new ideas, and new voices. His books says that all – faculty, boards, bureaucrats, and politicians – and how together, they have failed the student. Levy of GST on higher education is yet another burning issue that is raising eye brows and like other people leaving people perplexed on compliance procedures. Services procured by higher education sector like transportation, security, hostels-mess and canteen, training; medical services, shops and admission related services amongst others are under now GST. Various faculties, outsourcing services, guest lecturers are also liable to be brought under taxation that was not the case before GST. According to G Viswanathan, president of the Education Promotion Society for India (EPSI), a national network of private HEIs, former MP and chancellor of VIT University, EPSI has submitted a memorandum the government apprising it of serious implications of GST levy for higher education. 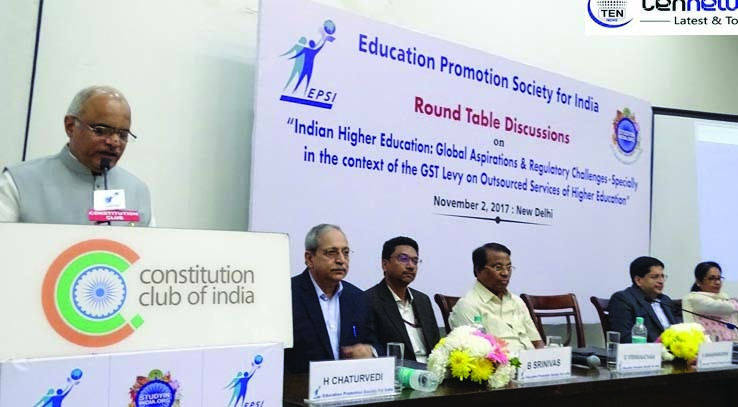 He informed of this during a seminar organized by EPSI on “Indian Higher Education: Global Aspiration & Regulatory Challenges – Specially in the context of the GST Levy on Outsourced Services of Higher Education” in Delhi on November 2. 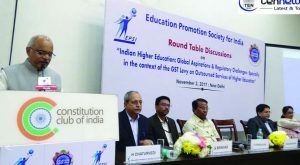 While Sanjay Garg, Partner, KPMG said that the current regime of GST which works on uninterrupted and automatic supply chain concept, makes concessions on listed higher education service nearly impossible to extract, a clearer and knowledgeable understanding on part of HEIs can make them informed participants in this tax reform. All were in agreement that this levy will increase the cost of education for student and government must think of setting off this cost with alternatives such as scholarships etc. Experts opined that if government expands the exemption of education like that of school education to whole education including skills, it will have a good effect on growth of GER. Prof. (Dr) R S Bawa, Vice Chancellor, Chandigarh University thought GST on higher education is best applied in Australia and we must consider it. He also brought out how tax-friendly countries like South Korea, Vietnam, Singapore etc were able to bring in massive investments in education in comparison to India. “Let’s remember one fact that had there been no Agriculture University in Ludhiana, there wouldn’t have been the Green Revolution that we all are so proud of. Innovations, patents, research are domains of a university and how can you tax pursuit of excellence,” he asked. According to Amolak Rathan Kohli, a former governor of Mizoram and an eminent educationist, education is also like food necessary for intellectual growth of a human being and it contributes to the critical human resources/capital of the nation. “As such it can’t be a stunted growth,” he said while criticizing the idea of taxing education. “The required reform in education has not taken place for long and in fact after 2006 when the then HRD minister started dialogue through a committee, the process has been lost. We now talk with the government through lawyers. That must change, we must support student interest. At present, one has to buy 13 NoCs and is difficult to start and run an institution. How can we expect an organic growth?” asks Vishwanathan. In his keynote address Dr. Vinay P Sahasrabuddhe, Member of Parliament, Rajya Sabha & National Vice President, BJP, asked the private education providers to demonstrate that greater public good has been achieved by private sector participation. “Let, there be academically carried out studies and not glossy handout on contribution of private sector. Let the truth of a well designed research come out in broad day light and you engaged in intellectual partnership with people even if some uncomfortable things also come to light. This is a way forward to dispel misconceptions, gain reputation and trust,” he added. Sahasrabuddhe also called for exploring and exporting Indian education models for regaining country’s primacy in education in the world. ‘We have models like Vashistha Ashram, where students leant from the conduct and behavior of mentors/teachers. ISKON schools world over have created a good impression about our values and pedagogy and I am sure world is in need of these models,” he added. 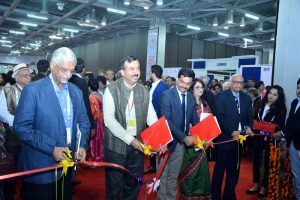 The annual FICCI Higher Education Summit (Nov 9-11), which entered in its 13th edition this year was another setting where higher education was in focus. In the knowledge papers released by the organizers, it has been said that India’s development and growth will be determined by the country’s response to the inevitable impact created by the interplay of three primary forces: globalization, demographic changes and the adoption of Industry 4.0 exponential technologies. Education institutions and regulatory framework have to embrace education 4.0 technologies and processes at a much faster pace to become a best higher education model by 2030. Organized at the Greater Noida Expo Mart (centre), the conference saw release of FICCI-EY report ‘Leapfrogging to Education 4.0: Student at the Core’ and FICCI Report on Social Outreach in Higher Education. Representing Finland, the Partner Country, participating in the summit with a 15-member delegation, Nina Vaskunlahti, Ambassador of Finland to India, said that Finland’s education system stands on four pillars of equality, efficiency, quality and internationalism. Finland’s education system is rated among the best in the world and the country would be forthcoming in sharing its knowledge, technology and best practices in the education domain with India. This year FICCI is signing a MoU with AICTE to take the agenda of Education 4. 0 ahead. Dr Sanjaya Baru, Secretary General, FICCI, said that better education would facilitate in creating a better talent pool for industry. Thus, there is a need to create an enabling atmosphere where the government, academia and industry could work in tandem and create synergies to take Education 4.0. forward. Sangeeta Godbole, Director General, Services Export Promotion Council (SEPC), said that SEPC would bridge the gap between academia and industry while pushing for greater autonomy in the education sector, policy reforms and internationalization of education.